Kauai 2013, Abrigo ‘Ohana Charms EKK Audience. Abrigo ‘Ohana Charms EKK Audience. As always, seating is limited at the Kaua’i Beach Resort; anyone wanting a seat should be there well before 7:00 pm! ! ! The 6:00 – 7:00 ‘ukulele hour will expand into a three-ring circus tonight with three choices for workshop. The usual ‘ukulele hour will be taught by Leokane Pryor and CJ Boom Helekahi of Hana Maui. The new wrinkle is Kaliko Beamer-Trapp, noted Hawaiian language instructor from Hawai’i Island, who will be working with those wanting to learn the fun and simple of hakumele . . . be there ready to go at 6:00. 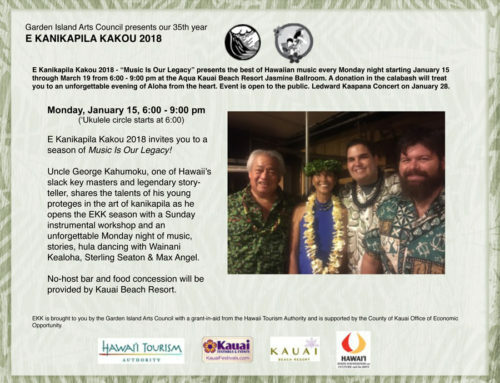 Kaua’i’s eminent kumu hula Kehaulani Kekua is joining her good friends in a hula circle; she is also bringing some of her halau dancers to join the program. The Abrigo family is as rare and special as you could hope to meet. At first glance it appears that they have three talented children who can sing, but when you get ni’ele and ask questions, you find that they are a very special blend of smart talented siblings, nurtured, taught and coached by very akamai and resourceful parents who are committed to helping their children be the best that they can be, whose idols and mentors are world-class pillars in the world of Hawaiian music — folks like the late Aunty Genoa Keawe who definitely inspired Emily and Uncle Led Kaapana who inspires just about every musician who hears him. Home-schooling can take many forms but when you look at what this family does under the label of home-schooling, it is no wonder that these three siblings — Timi who just made 18, Emily who is 14 (going on 24) and Quinn who is 10 but very precocious for his age, are as accomplished as they are. Wanting to spend as much time on their music and wanting to advance in their studies at their own accelerated speed, the kids have produced their first CD entirely on their own and are now working with Dad Tim on building their own sound studio as part of their studies. It also gives them as much quality time to spend together as a family and extends into their hobbies and free time which shows that they have learned to appreciate the simple pleasures of life. An extended visit to Kaua’i to celebrate Timi’s 18th birthday gave the family time to enjoy shoreline fishing, a family pastime taught by Dad Tim, with very short 20-inch fishing poles complete with reels that they tested along Kaua’i shorelines in Kapa’a and Nawiliwili. Although wheel-chair bound, Tim is fully involved with every aspect of their life, often video-taping their many performances around these Hawaiian Islands. Although young in age they have been active in the island music scene as can be viewed on U-Tube. I asked Emily about one of her earlier performances as shown on U-Tube and noted how much her voice has developed; she said she was only ten or eleven then. If she sang like that at age 10 and sings the way she does at age 14, I would like to see where she takes it when she is 18 years old . . . quite a remarkable voice. She sang two of Aunty Genoa’s songs — Ale Koki and Alika as the hana hou number. Standing ovation! All three of them sing and play several instruments. Timi can be seen on UTube playing the steel but he was on guitar for this trip, Emily plays guitar and has some very serious pipes, and young Quinn plays the ‘ukulele but often plays the upright bass, which for this performance was manned by Mom Lanet. Lanet was there backing up the trio, but they carried the show, taking turns at the introduction and story-telling and taking turns on the vocals. Quinn, although the youngest, had as much a part of the lead singing and commentary as the two older siblings. So charming is he that during intermission, several ladies came up and told me that they wanted to “take Quinn home.” “The line forms to my left,” I replied. He is cute as a button but right up there with the others in stage presence. In addition to Hawaiian classics such as Ahi La Makani by Queen Liliuokalani, Pua Olena by Jimmy Kaholokula, Rough Riders in the style of Sonny Chillingworth, Nani in the style of Ledward Kaapana, Maori Brown Eyes and especially the falsetto slayed by Emily, the trio sang a number of Creedence Clearwater songs which appear to be one of their favorite groups. They also sang a couple of songs written by Mom Lanet; Opae’ula was also taught to the ‘ukulele circle; Nani 0 Waialua speaks of their home way out in the country on the north end of the island. On top of all the singing, they also obliged the requests for hula — Quinn dancing Kalualoa about Damon Tract which is now Honolulu International Airport, Timi doing Aunty Irmgard Aluli’s Boy from Laupahoehoe which was the late Bill Kaiwa’s signature hula, and Emily showing her grace to Ikona sung by Tim. It was a charming performance by shared by three very talented young musicians; the audience loved it as they love every EKK Monday. Certainly they will appear more and more often on stages around these Hawaiian Islands . . . watch for them! We first started out in the nice warm carpeted cafeteria at KCC and when we got a record crowd of 100, the place was nicely packed; after Hurricane Iniki, we tried to make do in the crowded automotive classroom or the small music room but all that hermit-crab existence was a confusing challenge, so we moved to the Saint Michael’s parish hall which was fine for up to 125 people if some folks sat outside on the benches in the rain. Island School’s gracious hospitality and comfortable cafeteria with maximum capacity of 270 was fine for us for awhile but when 470 tried to attend and had to peer through the jalousies to see the program, we had to make a move to the Jasmine Ballroom at Kaua’i Beach Resort. Support from HTA made the added expense of the large ballroom space possible, but now…what to do? We have successed ourselves out of every available venue. Thirty years ago I could count the musicians I knew on one hand so the late Kaleo Kakalia took on the task of recruiting Hawaiian musicians for EKK. He told me that Hawaiian music has many different styles so he wanted to show that in his choice of artists. This has stood me in good stead as over the years we have shared many different styles of Hawaiian music — oldtime favorites, song by famous composers, top of the line slack key artists, ukulele stars, incredible falsetto singers, authentic chanters, kumu hula and their halau, himeni, hakumele, rare Niihau music, backyard musicians, hapa-haole musicians, steel guitar, duos, trios, Waikiki-style entertainers, world style music, bluesy, jazzy, and almost rock — you name it, you got it. In addition to the weekly Mondays, we have sponsored numerous ground-breaking concerts for Kaua’i. Who’s Coming Up at the Final TWO Nights of EKK?